ETF usage among institutional investors in Europe has been on the rise, and fixed-income ETFs have been a key driver behind this growth. Here, we discuss four primary reasons behind this trend. We expect the fixed-income index landscape to continue to expand, and for bond ETF assets to take part in this growth as more index options come available. ETF usage among institutional investors in Europe has been on the rise, and fixed-income ETFs have been a key driver behind this growth. 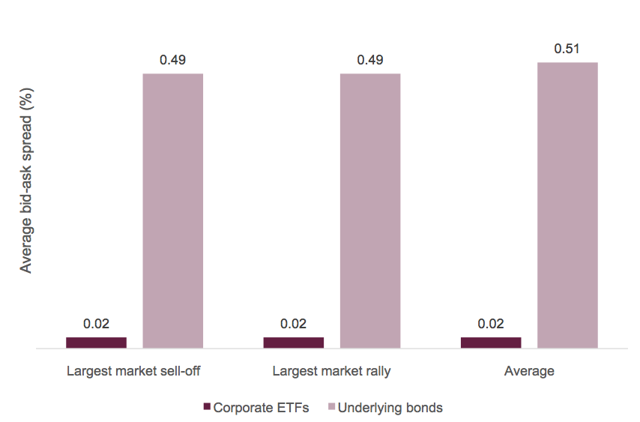 European institutions surveyed in a recent Greenwich Associates study indicated that fixed-income ETFs as a percentage of their portfolios more than doubled from 2017 to 2018.1 As fixed-income ETF inflows in Europe continue to pick up steam, we've identified four primary reasons behind this trend. The rapid growth of ETFs has given rise to many ETF misconceptions. One such myth is that ETF trading contributes to market volatility. However, more European investors are discovering that quite the opposite is true. In fact, a growing number of them have found ETFs to be useful tools during times of volatility, particularly in fixed-income markets. This is made possible by the unique ETF structure, which can enable investors to trade fixed-income exposures on an exchange like a stock-without transacting in the underlying bonds. Increased confidence in fixed-income ETFs among European investors can also be attributed to the indexes they track. Many index providers have expanded their fixed-income index offerings, providing transparency into how the bond indexes that ETFs track are constructed and how their constituents are priced. Among European institutions surveyed in the Greenwich Associates report, "ease of use" was the most commonly cited reason for using fixed-income ETFs. The bond market is fragmented and opaque by nature, and trading in individual bonds can be costly and time-consuming. Fixed-income ETFs provide easy access to broad fixed-income markets in a single trade on an exchange, offering instant diversification relative to individual bond investing. Given bond market pricing can be opaque, trading costs when transacting in the over-the-counter bond market can be high. However, through on-exchange liquidity, fixed-income ETFs provide quick access to the bond market without the need to transact in the underlying bonds. As shown below, trading costs have proven to be materially lower when transacting in the ETF versus the underlying basket of bonds, particularly during times of market volatility. Notes: ETF spreads are measured as the volume-weighted bid-ask spread across all corporate ETFs. Barclays LCS is used as the proxy for bond market bid-ask spreads. The performance of the Bloomberg Barclays U.S. Credit Corporate e-10 Year Total Return Index was used to identify the largest single-day market moves and underlying bond bid-ask spreads. Data include observations between January 3, 2017, and October 21, 2018, from the zero to 99th percentile and exclude holidays. Many index providers have expanded their offerings in response to this increased demand for fixed-income index investing. While bond indexes were once limited to broad market coverage of corporate and government bonds, they've now grown to include a wide range of market segments across credit quality, sector and region. With respect to the way forward, we expect the fixed-income index landscape to continue to expand, and for bond ETF assets to take part in this growth as more index options come available. Trends that have long been underway in equities - such as ESG and alternatively weighted indexes - have also begun to emerge in fixed income, and the bond index landscape is evolving to include these offerings. At FTSE Russell, we've also continued to develop our fixed-income capabilities in response to the rising demand. We currently have $3.5 trillion in fixed-income assets benchmarked to our indexes2, with an index pipeline largely focused on fixed income. And as the bond index landscape continues to expand and evolve, we remain committed to ongoing investor education. 1 Greenwich Associates, "In Turbulent Times, European Institutions Turn to ETFs, Q1 2019"
2 Data as of December 31, 2017 as reported on April 2, 2018 by eVestment for institutional assets, Morningstar for retail mutual funds, insurance products, and ETFs, and additional passive assets directly collected by FTSE Russell. AUM data includes blended benchmarks and excludes futures and options. Passive assets directly collected by FTSE Russell have been removed from third party sources to prevent double counting. No assurances are given by FTSE Russell as to the accuracy of the data. © 2019 London Stock Exchange Group plc and its applicable group undertakings (the "LSE Group"). The LSE Group includes (1) FTSE International Limited ("FTSE"), (2) Frank Russell Company ("Russell"), (3) FTSE Global Debt Capital Markets Inc. and FTSE Global Debt Capital Markets Limited (together, "FTSE Canada"), (4) MTSNext Limited ("MTSNext"), (5) Mergent, Inc. ("Mergent"), (6) FTSE Fixed Income LLC ("FTSE FI") and (7) The Yield Book Inc ("YB"). All rights reserved. FTSE Russell® is a trading name of FTSE, Russell, FTSE Canada, MTSNext, Mergent, FTSE FI, YB. "FTSE®", "Russell®", "FTSE Russell®", "MTS®", "FTSE4Good®", "ICB®", "Mergent®", "The Yield Book®" and all other trademarks and service marks used herein (whether registered or unregistered) are trademarks and/or service marks owned or licensed by the applicable member of the LSE Group or their respective licensors and are owned, or used under licence, by FTSE, Russell, MTSNext, FTSE Canada, Mergent, FTSE FI, YB. FTSE International Limited is authorised and regulated by the Financial Conduct Authority as a benchmark administrator.